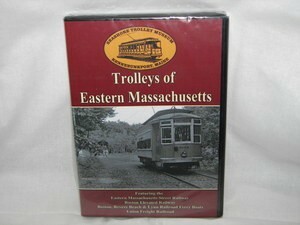 This DVD provides a look back to the 1930's and 1940's when trolleys served many of the smaller cities in Eastern Massachusetts. The Easter Massachusetts Street Railway lines in Haverhill, Lynn, Medford, Quincy and Brockton are featured. Streetcar equipment used includes Birney cars, semi-convertible cars and deluxe lightweight cars. Scenes show the cars in the cities and in rural areas. The program also features a brief view of the Boston Elevated Railway operations of rapid transit and streetcar equipment in the 1930's. Finally there are scenes of two of Boston's unusual transportation companies, the Boston, Revere Beach and Lynn Railroad ferry boats across Boston harbor and the Union Freight Railroad which operated steam powered freight trains in the shadow of the Atlantic Avenue Elevated on Boston's waterfront. 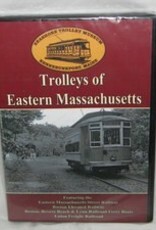 This program is produced by the New England Electric Railway Historical Society, owner and operator of the Seashore Trolley Museum in Kennebunkport, Maine. The Museum is a non-profit educational organization dedicated to the preservation of public transportation artifacts and history.